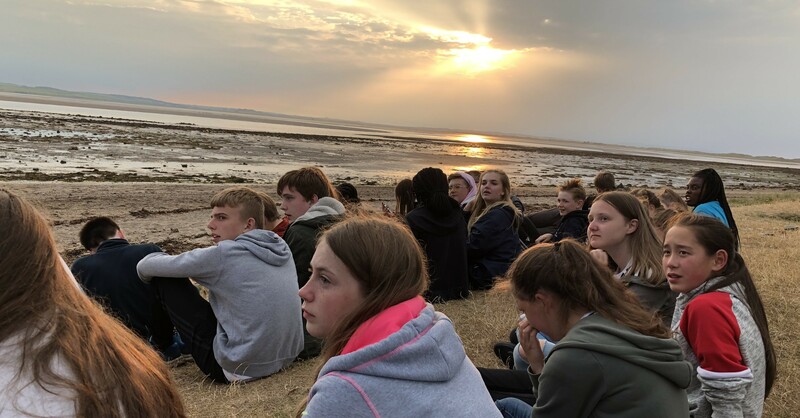 On the 13th of July 2018, 40 students set off on a geography trip to Holy Island. This trip was to celebrate all the hard work that we have done over the past year. We stayed at SVP Ozanam camp on Holy Island, but we barely spent any time there because everyday we were exploring the whole island. Holy Island was amazing! We did so many different things but first of all we got the coach from school to Seahouses. Before getting on the boat we got some food and visited the gift shop. The boat took us to the Farne Islands, where we saw seals, puffins and other sea birds. There are between 15 to 20 little islands that make up the Farne islands. Once we had seen the islands, we travelled towards Holy Island, which is home to Lindisfarne Castle. 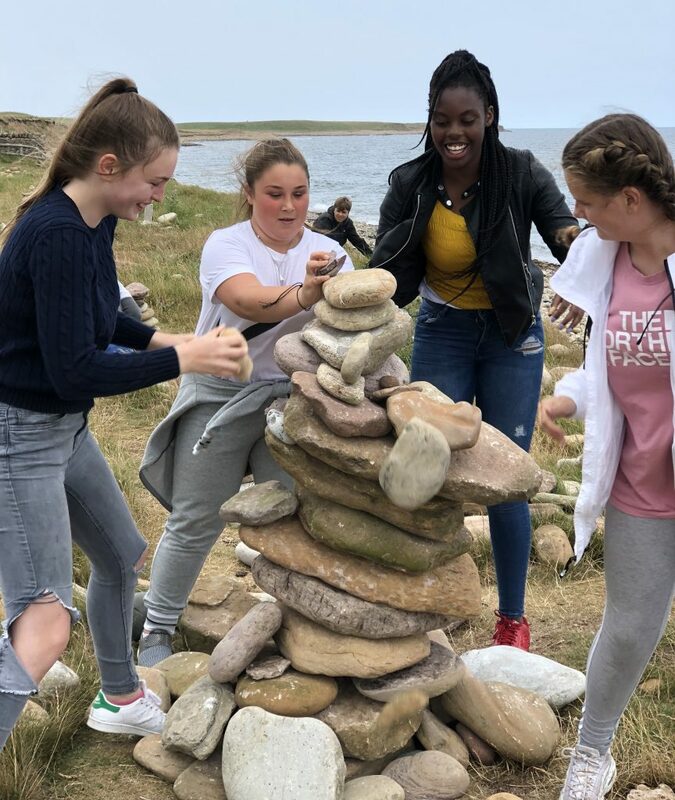 On the Friday evening, after we were shown our rooms and had some food, we headed out for a walk to the beach beyond the castle, where we had a competition to see who could build the highest stone tower. We then walked back to the camp, singing some songs and playing some games along the way. When we got back to camp we then played bingo as we were given hot chocolate, then it was time for bed. On Saturday morning we got up at 7:50am, the time most of us have to get up for school! Mr Murray started the day by making us do a quick work out to warm things up, including star jumps, before we went in to have our breakfast. 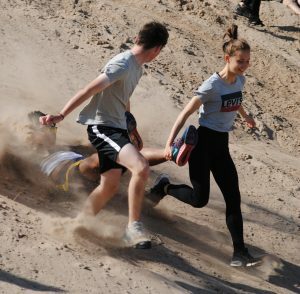 After breakfast we headed out to climb ‘Dead Man’s Drop’, the highest dune on the island, where we raced up and down the dune, jumped off a ledge into the sand, and finished by ‘ironing’ the dune to make it smooth when we had finished. We then spent the rest of the day at the beach, where we played a lot of games, some of us went in the water, and some of us sunbathed, getting ridiculous tan lines. We sang a few more songs, played a few more games then headed back to camp. Sunday morning came and we again had to get up a 7:50am. Again we were made to work out after breakfast before a treasure hunt round the shops. Before leaving the island we attended mass, then got on the coach and came back to school. When we all got home it was really strange, having spent the whole weekend with all your friends then when you get home they aren’t there! Holy island was amazing if you get the chance go it is really good! 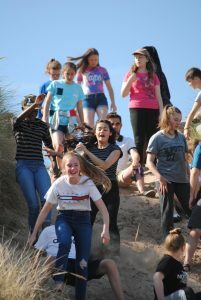 We had lots of fun walking around the island and got to learn all about Holy Island’s history as well as sing songs and spend time with our friends.